This chapter addresses a significant theoretical gap in the Web 2.0 (or “Web 2.0+,” as it is referred to by the author) literature by analyzing the educational implications of the “seismic shift in epistemology” (Dede, 2008, p. 80) that is occurring. As already identified in Chapter 2, there needs to be a consistency between our own epistemic assumptions and those embedded in Web 2.0. Hence the underlying premise of this chapter is that the adoption of social media in education implies the assumption of a very different epistemology—a distinctly different way of understanding the nature of knowledge and the process of how we come to know. The argument is that this shift toward a radically altered, “postmodernist,” epistemic architecture of participation will transform the way in which educators and their students create and manage the production, dissemination, and validation of knowledge. In future, the new “postmodern” Web will increasingly privilege what we may usefully think of as a socially focused and performance-oriented approach to knowledge production. The expected subversion and disruption of our traditional or modernist power-knowledge system, as already evident in the Wikipedia phenomenon, will reframe educational practices and promote a new power-knowledge system, made up of new, social ways in which to construct and control knowledge across the Internet. The chapter concludes by advocating strategies for critical engagement with this new epistemic learning space, and posing a number of critical questions to guide ongoing practice. At its core, this chapter argues that to understand the educational implications of the shift from Web 1.0 to Web 2.0 we have to understand the latter not as a technological but as an epistemological revolution. From that perspective, what sets Web 2.0 apart is that it introduces radical changes in the production, distribution, evaluation, and use of knowledge, to the point that its educational appropriation “involves an apprenticeship in new kinds of knowledge practice” (Beetham, 2007, p. 2). 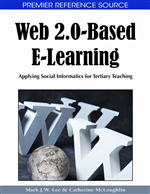 This distinction is set to remain in the foreseeable future, hence from this point forward the term “Web 2.0+” will be used, The plus sign (+) signifies that subsequent iterations will further consolidate and extend this participatory paradigm (Eijkman, in press). The above implies that, as the chapter will show, the epistemological frameworks of Web 1.0 and Web 2.0+ stand in opposition to each other. Web 2.0+, as a new site of intensified social digitization, privileges a social understanding of knowledge and values procedural or performance-oriented knowledge, where the focus is on “knowing how.” In contrast, Web 1.0, in common with traditional education, emphasizes a psychological understanding of the nature of knowledge and stresses the individual acquisition of propositional knowledge, which focuses on “knowing what.” This drastic shift in the organization and availability of knowledge “opens up many questions about traditional forms of transmission and the organisation of the transmission of knowledge. For example what is taught and learnt, when and how; who is learning and who is teaching and which knowledge is important” (Owen, Grant, Sayers, & Facer, 2006, p. 45). To illuminate the ways in which Web 2.0+ provides higher education with very different means of creating and evaluating knowledge, the chapter makes explicit the usually implicit assumptions about the nature of knowledge and how it is constructed (Carter & Little, 2007). It illustrates the alignment of both Web 1.0 and traditional education with a modernist epistemic framework, in contrast to Web 2.0+’s more postmodern epistemic stance, with its performance-centered, social understanding of the nature of knowledge. The analysis in the chapter reveals a clear epistemic disconnect between the modernist worlds of Web 1.0 and conventional education practices on the one hand, and the postmodern stance of Web 2.0+ and social constructionist approaches to education on the other. Additionally, given that Web 2.0+ offers users unparalleled access to the ownership and control of knowledge construction, the chapter also identifies the educational impact of a distributed rather than centralized approach to epistemic authority and control, as the knowledge production and justification apparatus is no longer only in the hands of a privileged elite. Consequently, the chapter points out how this new focus on communal participation and control is of such magnitude that it will increasingly disrupt the powerful practices of dominant knowledge institutions to the extent that it may overturn the epistemic base of our current educational power-knowledge system, along with its pedagogic and curricular practices (Foucault, 1980). A note about the “epistemological”: at first glance, a philosophic discussion may seem irrelevant to the practical realities of learning and teaching. However, as will be shown, the epistemic tensions embodied in the postmodern Web are both substantial and significant. Web 2.0+ is above all about engaging educators and learners in very different modes of knowing that demand more mature, open, and transparent forms of authentic, real-world, “non-scholastic social practices” (Lankshear, 2003, p. 177). Web 2.0+’s suite of participatory spaces, which shift learning from being a process of acquiring propositional knowledge to one of acculturation into a community of practice (CoP), pose a fundamental challenge. They are a threat to decontextualized learning, to a psychologistic understanding of knowledge, and to a system in which the authority of knowledge is centralized and vested in educational and professional elites. The heated debates about Wikipedia among educators are indicative of the significance and contested nature of this shift (Eijkman, in press).